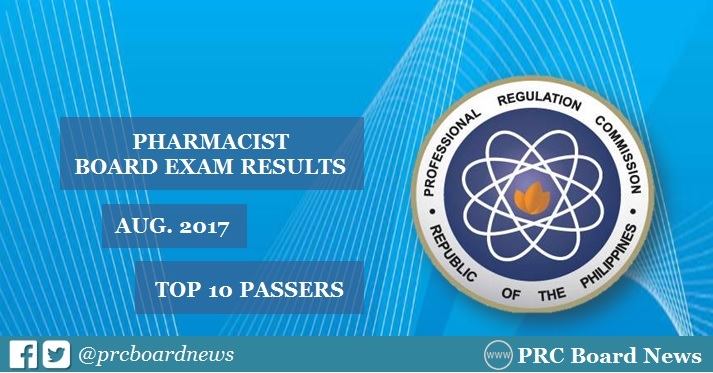 The August 2017 Pharmacist board exam top 10 or topnotchers together with other results - list of passers, top performing schools and performance of schools are out online on Tuesday, September 5, 2017 or in 2 working days after the last day of exam. Jannylene Rose Tolentino Chua from University of San Carlos (USC) topped the board with 91.10%. It was followed by Kimberly Tan Lomantas of University of Immaculate Conception-Davao and Genmar Cyrus Sael Pasion from University of the Philippines (UP) -Manila, who have tied on second spot, 91.05%. The Professional Regulation Commission (PRC) conducted the second board exam for pharmacist this year on August 30 and 31 in the cities of Manila, Baguio, Cebu, Davao, Iloilo, Tuguegarao and Zamboanga. In the June 2016 board exams, John Bryan Guadalupe Ruba from University of the Immaculate Conception - Davao topped the board with 92.85%. Jennilyn Daza Yambao of Our Lady of Fatima University (OLFU) - Valenzuela ranked second garnering a close rating of 92.80%. In July 2015, University of Santo Tomas (UST) alumnus Mark Pascual Dumago led the examinees with 93.35%. Jerson Jerick Ngo Taguibao of University of the Philippines (UP) - Manila got the second highest place with 92.97%. Here's overview of topnotchers for Pharmacist exam in the past two (2) years.